Sometimes I feel all adults deserve an award. Just for doing all those adult type things. It’s hard! There’s a thing that starts with an “r” and ends with “esponsible” that you have to become, and lemme tell you kids, it’s not fun! There should be an award program for all of us. I like how it was in elementary school. Hey Marzia, you tied your shoelaces all by yourself! Great Job! You get a gold star! Hey Marzia! You cleaned the place up and kept it clean! Well done! You picked up the dry cleaning only a day late this time – you’re so good at life! Those chocolate covered espresso beans in the kitchen cupboard, you only ate HALF the bag! You’re a superstar! Hey girl, you managed to do 3 loads of laundry and even mastered folding some stuff! You go! Those bills didn’t pay themselves! Look at youuuuuu! That little cupcake you’d been eying at the coffee shop, you showed it who’s boss! Your mom doesn’t have to run after you to eat your veggies! Three gold stars! That’s right mama, you taught me well. I eat them all by myself now! This salad is big! With lots and lots of green! 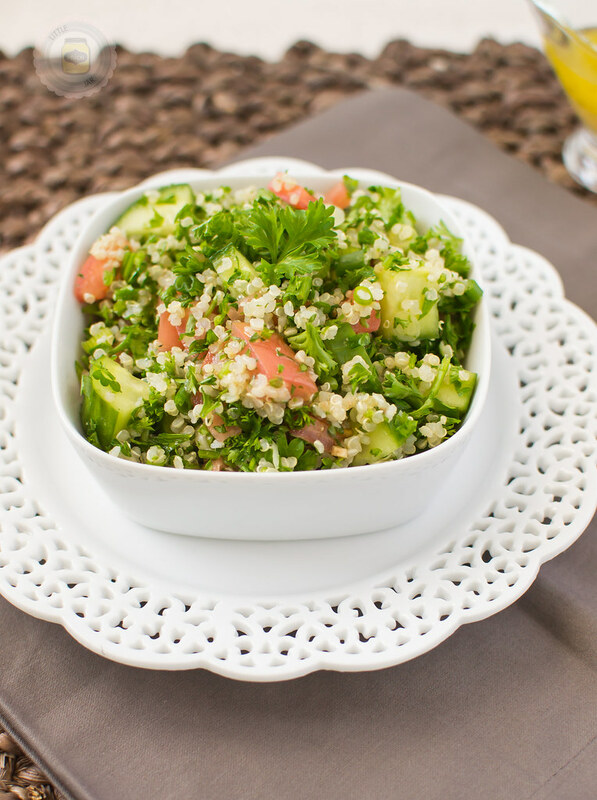 And quinoa instead of the bulgar which is traditionally used in tabbouleh. It’s a nice little twist on a middle eastern fave! Lets talk quinoa for a sec. Quinoa is a grain. It’s gluten free, contains both more protein and dietary fiber per serving when compared to rice, per serving. 1 cup of dried quinoa will normally yield about 3 cups cooked. For this recipe, I cooked 1 cup and used 2 cups from there. You could easily use 2/3 cup uncooked to yield the 2 cups necessary. 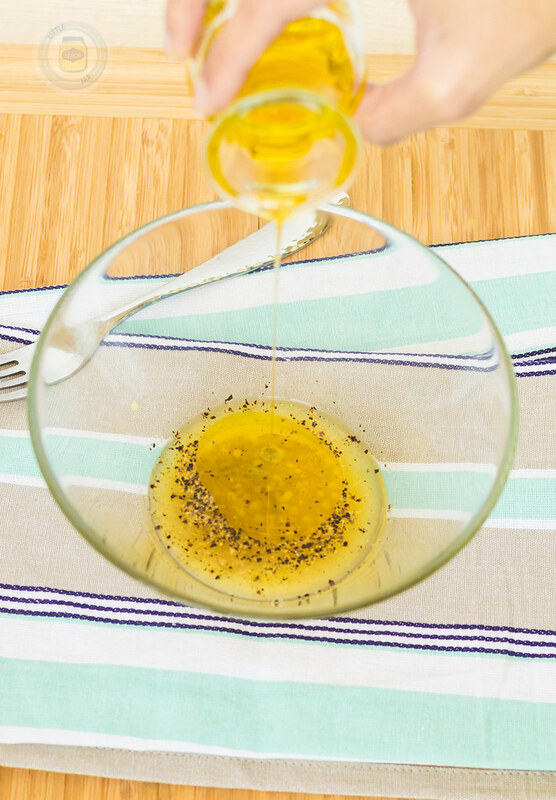 A super simple dressing a little lemon juice, a bit of salt and pepper, a tablespoon of garlic, and a big splash of EVOO. Chop those greens! 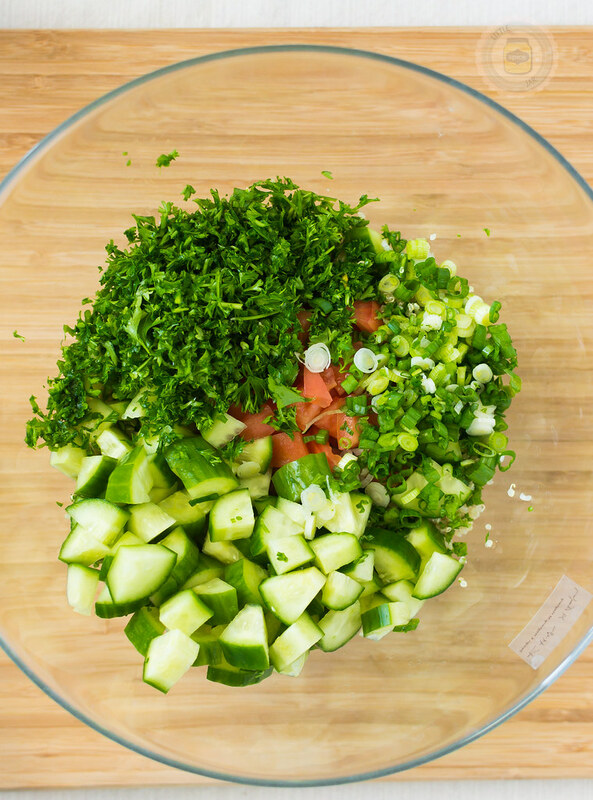 I used Persian cucumbers in this tabbouleh salad if you can’t find them, no worries, use hot house cucumbers instead! A quick chop to a super yummy, light, and fresh salad! Side note: That’s right, theres a sticker on that bowl. I tried my hardest to get it off. It was evil! It just wouldn’t give!! Adding quinoa instead of bulgar to a Middle Eastern favorite. This salad is light, fresh, and flavorful. Great for lunch or a side salad with dinner! Completely vegan and gluten free. In a small bowl, whisk together the lemon juice, garlic, salt and pepper. Gradually whisk in the olive oil. 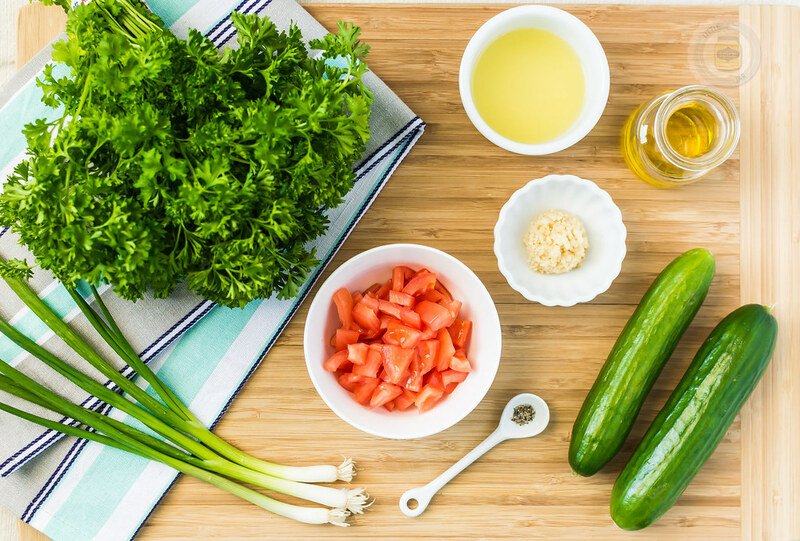 Add cucumbers, tomatoes, parsley, mint and scallions to large bowl with quinoa and mix all the ingredients well. Drizzle the dressing over and mix well. Taste for seasonings, adjust salt and pepper to personal preference. 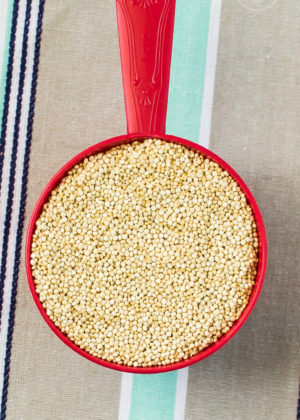 To cook the Quinoa: rinse quinoa in a mesh strainer under running water for a good 2 minutes. In a 2 quart saucepan, heat 2 teaspoons of olive oil. 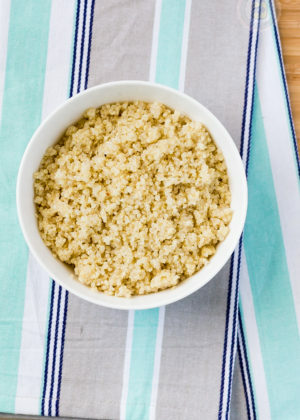 Toast the quinoa in the olive oil for 1 minute. Add the water and 1/4 teaspoon salt and bring to a soft boil. Cover the saucepan, lower the heat to medium low, and cook for about 15 minutes or until the water is absorbed. Turn off the stove and let stand 5 minutes before fluffing with a fork. For 2/3 cup dried Quinoa, you will need 1 cup water. This will yield 2 cups cooked Quinoa.